I have heard many people refer to the clear liquid inside a coconut as “coconut milk”. I have even read it in books. So, at the risk of boring those who already know, let’s establish right away what coconut milk really is. It’s the milky liquid extracted from the grated flesh of mature fresh coconuts or reconstituted from desiccated coconut. It is an important ingredient in the cookery of many dishes. It is used in soups, curries, (savoury meats and seafood mixtures for those meat eaters out there) and all kinds of desserts. It has an unmistakable flavour and richness and should be used in recipes that call for it. These days coconut milk is widely available in tins from the supermarket. Problematically, the quality between brands varies enormously so it is worth comparing a few brands and checking the ingredients list – it should only have coconut and water in it. It should smell and taste fresh and clean and be neither watery nor solid. It is better to avoid brands that include stabilisers and preservatives. Shake the tin well before opening to disperse the richness evenly throughout. Brands in Tetra Paks tend not to be lumpy or watery. 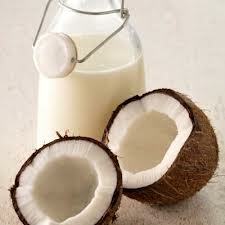 Delicious as it is, coconut milk is full of saturated fat. With this in mind, I suggest that only when coconut cream is required should you use the tinned coconut milk undiluted. Where a recipe calls for thick coconut milk, dilute the tinned product with half its volume in water (for example, 1 cup of tinned coconut milk and 1/2 cup water). Where coconut milk is required, dilute the tinned coconut milk with an equal amount of water. Where thin coconut milk is required, dilute the tinned coconut milk with two parts by volume of water (for example, 1 cup of tinned coconut milk and 2 cups water). If you would like to make your own coconut milk, the extraction method is below. Traditionally, coconut milk is extracted in 2 stages – the first yield being the “thick milk”, the second extraction producing “thin milk”. Use a mixture of first and second extracts when a recipe calls for coconut milk unless thick milk or thin milk is specified. Sometimes they are added at different stages of the recipe. Some recipes use “coconut cream”. This is the rich layer that rises to the top of the thick milk (or first extract) after it has been left to stand for a while. 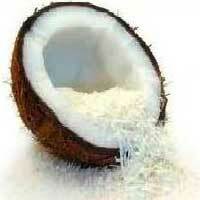 Many cooks use desiccated coconut for making coconut milk. It is much easier and quicker to prepare than grating fresh coconut, and in curries you can’t tell the difference. Put the desiccated coconut into a large bowl and pour over 625 ml (2 1/2 cups) of the hot water then allow to cool to lukewarm. Knead firmly with your hands for a few minutes, then strain through a fine sieve or a piece of muslin (cheesecloth), pressing or squeezing out as much liquid as possible; this is the thick coconut milk. Repeat the process using the same coconut and remaining hot water. This extract will yield the thin coconut milk (because of the moisture retained in the coconut the first time, the second extract usually yields more milk). Alternatively, to save time, you can use an electric blender or food processor. Put the desiccated coconut and 625 ml (2 1/2 cups) of the hot water into the blender and process for 30 seconds, then strain through a fine sieve or piece of muslin (cheesecloth), squeezing out all the moisture. Repeat, using the same coconut and remaining hot water. Sometimes a richer milk is required. For this, hot milk replaces the water and only the first extract is used. However, a second extract will yield a flavoursome and reasonably rich grade of coconut milk that can be used in soups, curries or other dishes. A coconut grater is something important in any kitchen where coconuts are used in any cooking. Grating fresh coconut is easy if you have the right implement for the job. However, if you are able to get fresh coconuts and don’t have one, use a food processor to pulverise the coconut and then extract the milk. Preheat the oven to 180’C (350/Gas 4). Crack the coconut in half by hitting it with the back of a heavy kitchen chopper. Once a crack as appeared, insert the thin edge of the blade and prise it open. Save the sweet liquid inside for drinking. If you don’t have a coconut grater, put the 2 halves on a baking tray and bake in the oven for 15-20 minutes, or until the flesh starts to come away from the shell. Lift it out with the point of a knife, and peel away the thin dark brown skin that clings to the white portion. Put the coconut flesh into a food processor with 500 ml (2 cups) of the water and process until the coconut is completely pulverised. Strain the liquid using a sieve or muslin (cheesecloth) to extract the thick coconut milk. Repeat this process using the same coconut and remaining water to extract the thin milk. Leftover freshly extracted or bought coconut milk may be frozen – ice cube trays are ideal. 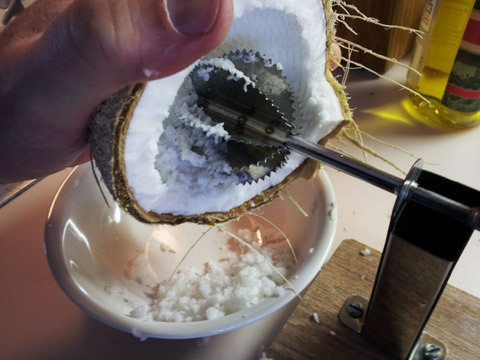 An example of a simple coconut grater. Worth investing in one if you can.